As with the case of its predecessor, Windows 10 also allows users sign-in and use the operating system using a Microsoft account instead of the traditional local user account. For the uninitiated, MSN, Outlook.com, Hotmail, and Live email addresses all come under Microsoft account. With a Microsoft account, you can easily sync various Windows settings and your account settings across your computers. For instance, a Microsoft account allows you sync your passwords saved on the Edge browser and other personalization settings across your PCs running Windows 10 with the same Microsoft account. Additionally, you will be able to download and install apps from the official Windows Store. There are many users who are neither interested in downloading apps from the Store nor want to sync and backup account settings. For those users who are not interested in a Microsoft account, there is a way to install Windows 10 without a Microsoft account and create a local user account in Windows 10. While one can always migrate from Microsoft account to local user account and vice versa even after installing or upgrading to Windows 10, you can go for the local user account during the install or upgrade. Here is how to create a local user account while installing or upgrading to Windows 10 to install and use the operating system without a Microsoft account. 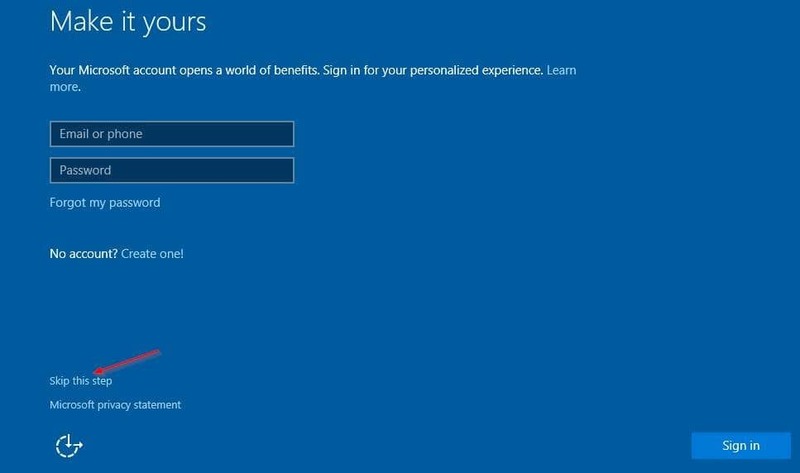 Step 1: Towards the end of the installation or upgrade process, you’ll see the following screen where you will be asked to enter your Microsoft account ID and password. 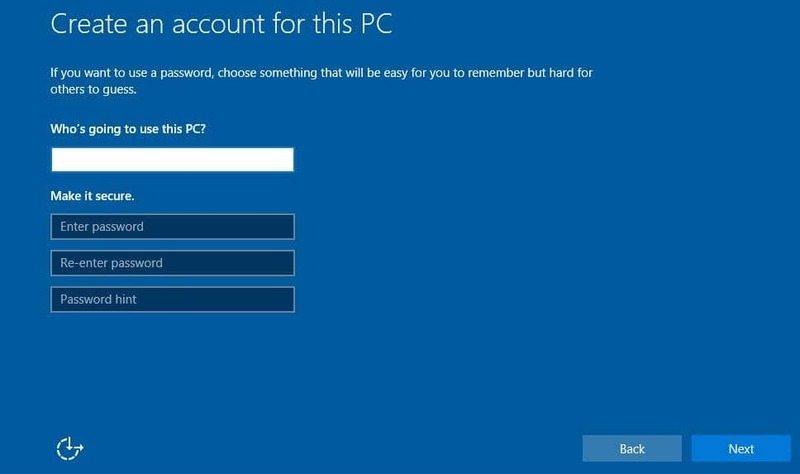 Step 2: To create a user account and use Windows 10 without a Microsoft account, simply click the option titled Skip this step (as shown in the above picture), located lower-left of the screen. Step 3: In the following screen, you will be asked to setup a local user account by typing a name for your account and securing the account with a password. After entering a name for the local account and typing a password to protect the account, click Next button to continue the installation or upgrade. And if you have already installed Windows 10 and want to migrate from Microsoft account to local account, please check out our how to switch from Microsoft account to local account in Windows 10 guide. @ Elizabeth, navigate to Settings app > Accounts > Your Info. Click on Sign in with a local account instead link and then follow on-screen directions. Not helpful. I had a local login with my name, then I logged in via Windows and now I want to go back to my local name … but can’t use it because it’s the same as my Windows login name. I just want to log out, use my local login and not use Windows. Please advise. I do not see this when I first load win 10. Good article. I was looking to find out if i can install Win 10 without a microsoft account, and your article explained it plain and simple. Great article as always. Just wanted to point out that you can register any email account with Microsoft. Not just their own varieties.